NO. No. Absolutely not. The pit bulls of the media have sunk their teeth into the story and will not let go. 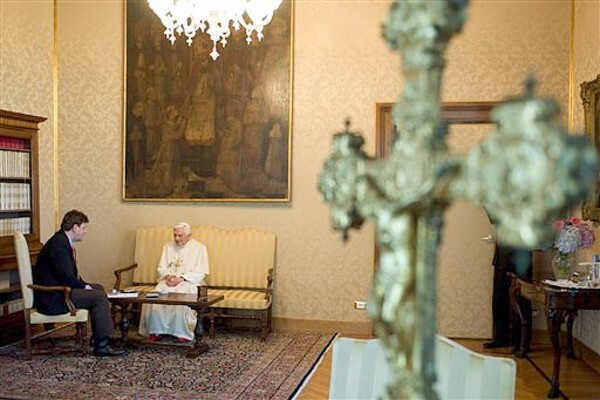 The two clarifications by the Vatican spokesman, Fr. Lombardi, here and here have their (the media) jaws firmly locked on the subject. “Here’s an example of this distinction that parallels what the Pope said. Muggers are using steel pipes to attack people and the injuries are severe. Some muggers use padded pipes to reduce the injuries, while still disabling the victim enough for the mugging. The Pope says that the intention of reducing injury (in the act of mugging) could be a first step toward greater moral responsibility. This would not justify the following headlines: “Pope Approves Padded Pipes for Mugging” “Pope Says Use of Padded Pipes Justified in Some Circumstances”, Pope Permits Use of Padded Pipes in Some Cases”. Of course, one may morally use padded pipes in some circumstances, e.g., as insulated pipes so that hot water flowing through them doesn’t cool as fast. And one may use condoms morally in some cases, e.g. as water balloons. But that also would not justify the headline “Pope Approves Condom Use”, though in this case it could be true. But it would be intentionally misleading. Fr. Fessio provides an excellent explanation of the moral theology involved. This entry was posted in Moral Theology, Pope Benedict XVI and tagged Condom Controversy, Pope. Bookmark the permalink. I can’t remember where I saw it, but there was another analogy about a bank robber pointing a gun at the bank teller. The gun was not loaded, so the robber was intimidating and stealing but had no intention of killing. Would the pope saying that using an empty gun to scare people is closer to recognizing error in ways, but he would not be approving of robbing banks. Again, thank you for defending the faith. Ever think of working Catholic Answers? I would love to work for Catholic Answers. They don’t know that I exist. Thank you LeAnn. I have been praying for you and your family. I thank you for your prayers. Prayers, B6 & Ativan are getting me through each day. Oh Susan, you do not know the half of it right now. I truly do not understand my place or purpose. God keeps moving the target and making the canyon wider. Have I not shown my obediance? Am I not like Abraham? I have a new situation and if its true, its a problem, if its a lie, that’s another kind of problem. You have been hit with many trials. I don’t have easy answers. But can we meet for a coffee? Do you need to speak with my deacon? How can we help?